Carolyn Elizabeth Robinson Cassady (April 28, 1923 – September 20, 2013) was an American writer associated with the Beat Generation through her marriage to Neal Cassady and her friendships with Jack Kerouac, Allen Ginsberg, and other prominent Beat figures. She became a frequent character in the works of Jack Kerouac, who wrote extensively about Neal Cassady. The youngest of five siblings, she was born in Lansing, Michigan. Of English descent, both of her parents were educators, her mother a former English teacher and her father a biochemist, who raised their children according to strict conventional values. She spent the first eight years of her childhood in East Lansing, then the family moved to Nashville, Tennessee, where she attended the Ward-Belmont Preparatory School for Girls. Although she enjoyed the school, she was less happy with Nashville and chose to spend her summers in Glen Lake, Michigan. After the move to Nashville, she developed her lifelong interest in the fine arts and theater arts. She began formal art lessons at age nine, sold her first portrait at age 14, and continued her interest in portrait painting as an adult. At age 12 she joined the Nashville Community Playhouse, where she won awards for set designs and became the head of the make-up department at age 16. She secured a scholarship to Bennington College, where she initially studied art and then switched to drama. In 1943, she studied for six months in New York City. Until she and her roommate could find an apartment of their own, they were hosted by playwright Robert E. Sherwood. By day she worked for Dazian's fabric company, by night she studied at Traphagen School of Design, and on weekends she browsed the Metropolitan Museum and the Museum of Modern Art for little-known prints of period dress. She attended Broadway stage productions, witnessed the beginning of the American Ballet Theatre and took in performances of the biggest swing bands of the era. Both she and her roommate became air raid wardens, serving as auxiliary members of the NYPD. At Bennington, Carolyn took classes with Martha Graham, Erich Fromm, Peter Drucker, Francis Ferguson and Theodore Roethke, obtaining her BA degree in Stanislavsky Drama in 1944. After graduation, she became an occupational therapist for the U.S. Army and served at Torney General Hospital in Palm Springs, California. When WWII ended, she returned to Nashville to continue her work at the Nashville Community Playhouse, paint and recover from her war experiences. In 1946, she moved to Denver, Colorado to study for her MA degree in Fine Arts and Theater Arts at the University of Denver. She worked as a teaching assistant and began a Theater Arts department for the Denver Art Museum. In March 1947, Carolyn met Neal Cassady, Allen Ginsberg and Jack Kerouac. Allen stayed in her residence hotel apartment for two weeks before finding an apartment of his own and Jack accompanied her to rehearsals at the University. In the evenings Carolyn, Neal and Jack frequented Denver's clubs to dance and hear music. It was during this period that Carolyn and Neal began their love affair, though at the time he was still married to his first wife, Lu Anne Henderson. In August 1947, Carolyn was shocked to find Lu Anne, Neal and Allen naked in bed together. She decided her brief romance with Neal was over and departed for Hollywood on the promise of a job opening as costume designer for Western Costume Company. While waiting for the job opening, Carolyn moved north to San Francisco, staying initially with an older married sister before finding temporary work and an apartment of her own. In a 2008 interview with literary magazine Notes from the Underground, Cassady stated that "As far as I'm concerned, the Beat Generation was something made up by the media and Allen Ginsberg." She goes on to say that Jack Kerouac could not stand the public image that was created for him. When the job as costume designer finally came through, she declined because she was pregnant. Neal worked at various jobs, finally becoming a brakeman for the Southern Pacific Railroad. On September 6, 1948, Carolyn gave birth to a daughter, Cathleen Joanne, the first of their three children. She expected life to settle down, but that December Neal spent their savings on a new maroon Hudson and made a trip with his friend Al Hinkle and Lu Anne to connect with Kerouac in North Carolina. Although Neal did make provisions for Carolyn's and baby Cathy's care, she considered Neal's sudden departure desertion and told him not to return. The story was immortalized in Kerouac's On the Road. Believing the marriage was finished, Carolyn moved with her infant daughter to an apartment near Mission Dolores in San Francisco. At the end of January 1949, Neal dropped Jack and LuAnne off on a San Francisco street corner and was back in Carolyn's life. Neal took care of baby Cathleen during the day while Carolyn worked as an assistant to a radiologist. In San Francisco Jack spent a few days as a guest in their apartment before returning to New York. After Neal resumed work with the Southern Pacific Railroad, the family moved to better housing. In 1952, Jack joined them for several months, beginning to write Visions of Neal, which later became On the Road, Visions of Cody and other works. With Neal's encouragement, Carolyn and Jack began an affair that continued until 1960. In 1953, Jack joined Neal working as a brakeman for the Southern Pacific Railroad, and he lived with them after they moved to San Jose, California. Carolyn and Neal had two more children, a daughter, Jami, and a son, John Allen, who was named after Jack (Jean-Louis) Kerouac and Allen Ginsberg. After receiving compensation from a railroad injury, they bought a home in Monte Sereno, California, which was then part of Los Gatos, a suburb about 50 miles south of San Francisco. Jack, Allen, and the other Beat writers often visited their Monte Sereno home. Carolyn continued to paint portraits and became costume designer and make-up artist for the Los Gatos Academy of Dance, the Wagon Stagers, the San Jose Opera Company, the San Jose Light Opera Company, and the drama club of the University of Santa Clara. In 1958, Neal was arrested by narcotic agents to whom he had given three marijuana cigarettes. He was accused of drug trafficking and served two years at San Quentin State Prison, leaving Carolyn to take care of their children and fend for herself on welfare. During this period she also continued her painting and theater work. After Neal was released from prison, he lost his railroad job for good and became progressively less reliable. When his parole ended in 1963, Carolyn decided to divorce him, mostly to free him from the burden of family obligations, a decision she later regretted. Without employment or family to anchor him, Neal joined Ken Kesey's band of Merry Pranksters and embarked on an endless series of road trips, dying in San Miguel de Allende, Mexico on February 4, 1968, four days short of his 42nd birthday. Although the exact cause of Neal's death was never determined, it is believed to have been caused by a combination of drug/alcohol use and exposure to the elements. Carolyn worked at a local newspaper and for radiologists, and she also extended her theater activities. In 1970, Doubleday commissioned her to write her memoirs of her life with Neal and Jack. However, she was unable to secure permission to print Kerouac's letters, and the book was temporarily shelved. Published in 1976, her memoir Heart Beat: My Life with Jack and Neal was later made into the movie Heart Beat starring Sissy Spacek as Carolyn. Carolyn was a founding member of the Academy of Parapsychology and Medicine (APM) and during the early 1970s served for four years as their correspondence secretary. In that capacity, she met many in the occult and medical world, including Uri Geller, Andrija Puharich, the Findhorn people and astronaut Edgar Mitchell, who started an institution much like APM after he'd seen Earth as a blue jewel. She also became acquainted with eminent astrologer Dane Rudhyar, and she corresponded with one of the Russian scientists behind the book Psychic Discoveries Behind the Iron Curtain. When APM closed, she served as office manager for a company that imported bamboo stakes from China to stock American nurseries. After all three children had married and left home, Carolyn longed for more cultural life than was available in the San Francisco suburbs. Her ancestors were all buried in England, and she had been brought up with many English customs, so in 1983, she moved to England. With London as her home base, she traveled extensively in Europe, Scandinavia and the Soviet Union, making many friends. In 1990, her memoirs were finally published in London as Off the Road: Twenty Years with Cassady, Kerouac and Ginsberg. 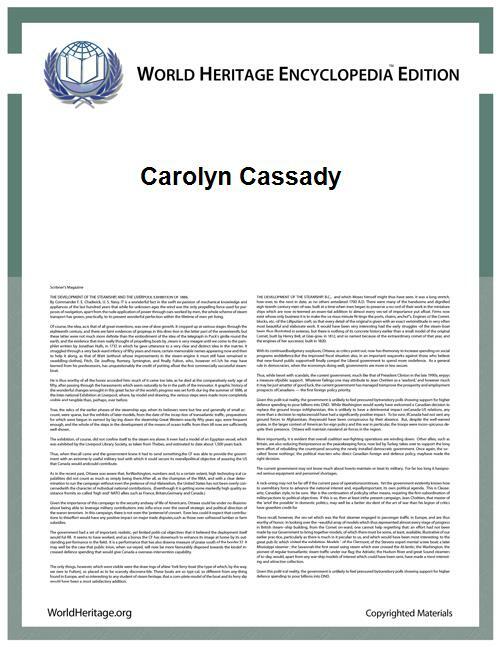 Carolyn participated in the 2011 documentary film Love Always, Carolyn in which she claims she is fighting a losing battle for the truth about Neal Cassady and Kerouac. She made her home in the English county of Berkshire, living near the town of Bracknell, about an hour outside London. After lapsing into a coma after an emergency appendectomy, Carolyn died at the age of 90 on September 20, 2013 at her home in Bracknell. In Kerouac's novel On the Road Carolyn's character is named "Camille". In the film adaptation On the Road (2012), Camille is portrayed by Kirsten Dunst. She also appears as "Evelyn Pomeray" in Kerouac's books Big Sur, Desolation Angels, Visions of Cody and Book of Dreams. In John Clellon Holmes' novel Go she appears as "Marilyn." In the film Heart Beat (1980), Camille is portrayed by Sissy Spacek. ^ "Love Always, Carolyn". Documentary trailer. IMDB. Retrieved September 9, 2011. ^ "Carolyn Cassady, writer and former wife of Neal Cassady, dies at age 90". Washington Post. Associated Press. September 21, 2013. Retrieved September 21, 2013. Off the Road: Twenty Years with Cassady, Kerouac, and Ginsberg. New York: Morrow, 1990; London: Black Spring Press, 1990; new Black Spring Press edition, 2007.